USING VOICE COMMANDS on a phone is still seen as a novelty to most people. The system to power this has been a long time in the making, with the first voice recognition software being developed in 1952, but those working in the field concede that we’re still a long way off pinning down systems to identify complex spoken sentences. Language is filled with nuances that have been hard to crack for computers. It is a rapidly developing area that, despite great advances, can still appear to a user to be in its infancy. There’s also still the issue that talking to your phone, rather than talking to someone over the phone, feels and looks a bit dumb. This hasn’t stopped Apple and Google from ploughing ahead with voice recongition systems, boasting of Siri’s and Google Now’s capabilities, and by introducing spoken commands as a key feature of wearable devices. This is evident in a new Google exhibition called OK Google, which the company gave us a tour of earlier this week. 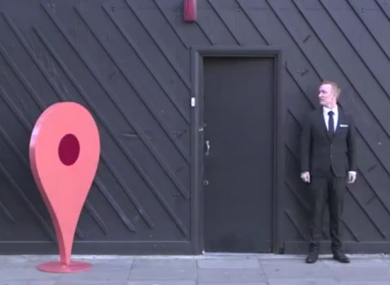 Located in a disused sorting office in the heart of London, marked only by a giant red pin outside, Google is showcasing how its apps can integrate into our day-to-day life. The OK Google exhibition takes visitors through a range of situations, from buying a wedding present in Taiwan to cooking an unfamiliar dish, demonstrating how apps can help. It’s essentially the company’s vision for a Google utopia, and voice commands feature heavily. Some of the demonstrations would be familiar to most people. For example, using shared word documents on Drive to collaborate with colleagues on the go, using Maps to plan a journey or find somewhere to get some dinner, and using the Photos app to edit pictures. They also gave us a go of their lo-fi Oculus Rift rival, Cardboard, which we took a look at earlier this year. Cardboard is pretty impressive, even if it did make a certain reporter from TheJournal.ie look a bit mad. Across all apps, Google is pushing that they can be controlled using simple voice commands. Google Now is similar to Apple’s Siri, but with less of a personality; Siri will humour your stupid questions. Now is the centre for voice commands, but it also offers a cards displaying information such as weather, upcoming appointments, travel times, reminders, and a whole host of other handy info. All of these can be inputted or accessed with a range of voice commands, such a “Will I need an umbrella today?”, or “Remind me later today to call Sam”. It’s used for key functions of Google Glass and Android smart-watches like the Moto 360, but can be accessed from an Android phone’s home-screen, or from the Google Search app on iOS, by simply saying “OK Google”. Entering the first stage of the bizarre demonstration, we were suddenly in a Taiwan street market (complete with Taiwanese street merchant) with the aim of buying a wedding present. Navigating this kind of awkward situation in a foreign language is where voice search can really comes into its own. Google Now told us it was going to rain, and we were tasked with buying an umbrella from the aforementioned merchant. Google Translate was quickly and successfully able to translate both sides of the conversation, from us asking for a number of umbrellas to the seller telling us the price (which we were then able to quickly convert from Taiwanese dollars). It’s important to note that at this stage in the demonstration, the sprinklers were turned on. Voice translation is now well developed and seemingly applicable in real-life situations. Most importantly, it actually works, as long as you keep the phrases simple and don’t veer into long sentences or the modh coinníollach. The Translate app was also used to translate text, but this didn’t work as smoothly. Because of the lighting conditions, some phones were unable to take an image clear enough for the app to decipher the text. Google apps will soon also be able to translate text in real-time, as the company recently acquired Word Lens. Using voice commands when cooking makes sense. Preparing food is messy, your hands are full, and the last thing you want is something spilled all over your tablet or phone. By just saying “OK Google”, the phone will pick up your request, without you having to touch anything. Google placed us under the orders of an angry sous-chef, we donned aprons, and were coerced into making kohlrabi salad. Using Now to figure out what kohlrabi salad actually is, and what a kohlrabi and other ingredients looked like, by searching on Google Images felt redundant. It’s hard to see quite how it could be used in a real-world situation. It also frequently didn’t pick up exactly what we were saying, although with a bit of coaxing did identify ‘kohlrabi’. There were a couple of applications for the voice commands that did feel almost natural. One was setting a timer (however on iOS this required an extra tap, which it doesn’t on Siri), and converting units of measurements from imperial to metric. You could ask the phone to remind you to buy more kohlrabi next time you’re in a shop (but you would have to set this up before hand). As Apple Maps is still floundering to make its presence felt, Google Maps remains dominant. It’s likely that it’s second to Gmail as the most-used Google app on a lot of smartphones. The app itself generally works quite well, but can throw up issues when being used for turn-by-turn navigation, but how well will it work with voice commands? We were piled into a camper van, with the intention of heading to some large European city (our trip around the OK Google house started to feel a little like a school tour at this stage). Our guide was able to quickly bring up directions to Paris on Google Maps (complete with live traffic info using technology from the recently acquired Waze app). If we intended to head to Paris, we would be set, but what if wanted to head to from Dublin to Wexford? To be exact, Raheenagurren near Gorey? This is where the day-to-day use of Google Maps voice commands doesn’t quite meet the grade just yet. It will recognise major place names, but still misses out when it comes to local places with funny names. Especially in Ireland, it’s unlikely the phone can recognise these. This means we’re likely to stick to typing in our destination – and more so if you’re abroad, unfamiliar with the local language. However, it will still be able to help you get some grub. By saying “I am hungry”, the app will give you a list of restaurants (you can then follow this up with commands such as “call the second one” or “show me only Italian restaurants”). Google’s apps, and iOS equivalents are coming on in leaps and bounds in terms of voice recognition, but daily usage of voice commands is still a long way off… for now. When it does work and removes the boundary of having to type out a message, it makes the entire user experience a lot smoother and more natural. For now, risking social ridicule by using voice commands on your phone might be worth, but it’s very much on a case-by-case basis until the technology improves. Email “Here's what Google is showing off in a hidden exhibition in London”. Feedback on “Here's what Google is showing off in a hidden exhibition in London”.